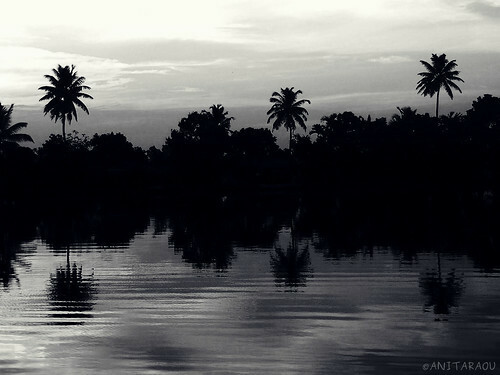 This entry was posted in Black-n-white, Lines, Monochrome, Nature, Silhouettes and tagged DPchallenge, Kerala, Photography, Reflections, Sky, Trees, Water. Bookmark the permalink. I couldn’t have written those words better myself, Anita. Nature is peace, peace in being close to nature. Wonderful shot! Beautiful image in b/w and I like your interpretation of the theme! Thank you, Anita! I’m glad even a B/W version manages to reflect the beauty of that day. Always the best time to be surrounded by nature! I too love the B&W treatment for this one. Thank you, Tina! Nature-therapy is powerful indeed. Beautiful. The B&W has added the magical touch to it. The water reflections are just amazing. So calm and serene, thank you, Anita! Have a wonderful week ahead. I can identify with that, and this is a beautiful landscape silhouette.